I failed in taking care of my current plans because I did something stupid! However, due to my failed plans I had the time to dig out the plans that I fulfilled and promised to share. Here is an explanation for the photo below… and the THO house plans at Tiny House Listings. Here is the result of my stupidity. I wish you would put a “Follow this Blog” button on your blog. I often forget which blogs I like to hear from so don’t get the info unless it comes through a related site. I’d love to follow your blog. You write about many things that are important to me – like the Boulder initiative to have a local power company. If I can follow you, the posts would come right to my email inbox! Hi Robin, I wish I was more techie! I tried to add it and I think I did. It should be just under the search button to the right of the screen. Please let me know if you can’t find it, or if you have any other suggestions as to how I can improve access or anything else on my blog. You did it – great job! I myself haven’t done a whole lot of things to get my blog out there – I’ve put no keywords or categories. Thus, I only have 30 followers. But that’s really ok until I decide whether I’m going to write consistently or not and what I’m going to write about now that my house is built. Mine is at http://www.gypsyturtlejournal.com if you are interested to check it out. Thank you Fabio! You should know that your English is perfect. Laura, please take care of that thumb and I hope you heal quickly so you can return to THO before the cold really sets in. I will head back on Sunday. Lots to do, hopefully I can move my thumb by then. I hope you are right handed! Thanks! I am six days in and I have no infection… but I have no mobility in my thumb joint so far… Hopefully once the swelling goes, it will be wiggly again. Poor you! I know how you feel. I have had a bad back all summer so my gardens and all my other plans have suffered. You on the other hand have accomplished a lot this year – both artistically and with THO. Congratulations! Thanks Linda Jean! 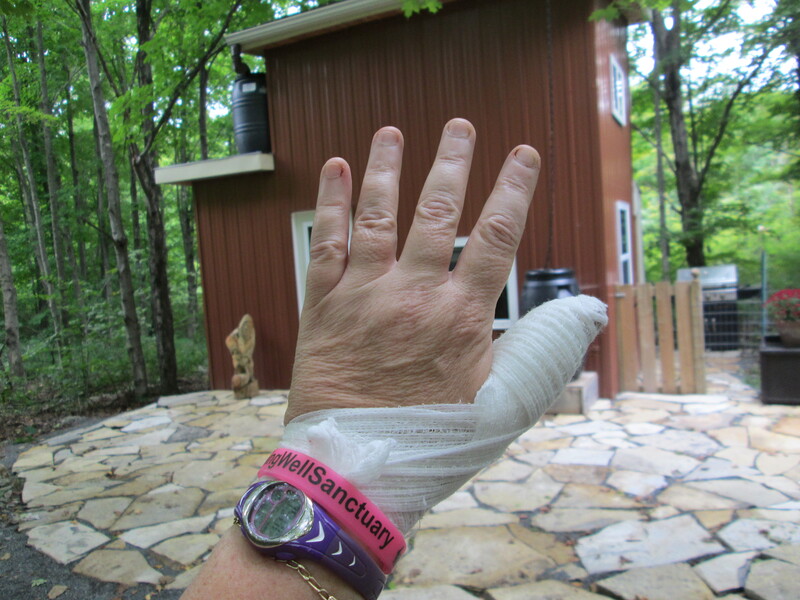 I have done a lot of rock work for sure… I am hoping my hand recovers well and fast so that I can get back to my cool project. No infection now 6 days later, so it is looking possible! Hope your back is on the mend! oh dear poor you. How did it happen? I explained what happened in the link above… in short though it was careless use of my Dozuki.